SANTA MONICA, CA--(Marketwired - Nov 15, 2017) - AdQuick, the easiest way to purchase and measure outdoor advertising, announced today that it has added new analytics features to its outdoor advertising platform that help advertisers measure the impact of their campaigns -- making outdoor advertising as measurable as online advertising. Founded by Instacart veterans, AdQuick was born out of frustrations with traditional outdoor advertising. Matt O'Connor, founder and CEO of AdQuick and former head of expansion for Instacart said, "When I was on the client side trying to find and book outdoor advertising space, I found the process extremely frustrating. There wasn't one place to go to find inventory, and once I did find space, the process to actually book was slow and tedious. Worse, no one could help me measure the impact of my campaigns. Based on our experiences at Instacart, we saw an opportunity to give customers a better way to buy, and give media companies tools to make them more modern." AdQuick launched its basic self-service platform for finding and booking space, and quickly landed clients of all sizes, from small businesses up to large companies and chains such as Lyft and H&R Block. This week, it adds new analytics tools to help clients -- for the first time -- measure the impact of their outdoor campaigns. Orange Theory Fitness in Los Angeles recently worked with AdQuick on a local outdoor campaign featuring shortcodes to drive SMS engagement. The campaign achieved a 560 percent ROI. "We were hesitant to use outdoor advertising because we didn't know how to measure it -- AdQuick showed us how," said Mark Steverson, franchise chain owner at Orange Theory Fitness. "They helped us architect a campaign that would be completely measurable, and we used the AdQuick platform to quickly and easily select our media, upload our graphics and then track results. We are really pleased with the outcome and will definitely do this again." Wine club Bright Cellars acquired nearly 100 new customers at a cost-per-lead of just $17. A well-known rideshare service achieved a 25 percent increase in unaided awareness, measured using geographic surveys. Hip-hop artist Drake's lifestyle brand, October's Very Own (OVO), captured 200,000 incremental impressions, measured via Instagram social scraping. A large aerospace recruiting firm proved 40 percent lift in site traffic using AdQuick's Google Analytics integration. AdQuick API integration with Google Analytics, which measures lift in site traffic by area. Advertisers add AdQuick's location snippet into their site code to gather a breakdown of increase in site traffic by geography driven by outdoor advertising. This technique has been proven to increase site traffic by 40+ percent versus controls. 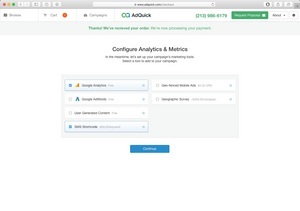 AdQuick API integration with Google AdWords, which measures cost-per-click by area, to quantify performance efficiencies in online advertising. As outdoor advertising drives up a company's awareness, its online ads perform more efficiently. AdQuick Social Media Image Recognition, an algorithm that scrapes social media images to quantify the number of additional impressions using campaign images or tags. AdQuick Shortcodes, beneficial for transit and pedestrian-focused campaigns. They give any campaign a call-to-action and make it more engaging, and results are easily measured simply by tracking shortcode usage. AdQuick Geo-fenced Mobile Ads, which measure engagement rate by area. AdQuick can create and serve ads on smartphones that mirror the message on outdoor advertising. This gives advertisers another way to measure engagement, and provides consumers with a way to learn more about a brand's offering and quantify the boost OOH drives in other channels. This technique has led to engagement rates that are 30-50% higher in areas with outdoor ads versus controls. AdQuick Geographic surveys, (based on zip code) tracking brand awareness and channel attribution in the areas surrounding the outdoor advertising locations. AdQuick Movement Tracking, for quantifying the increase in foot traffic an outdoor ad drives to a brick-and-mortar location. "In the past, outdoor advertising has been considered an awareness vehicle rather than lead-gen, because it hasn't been measureable," said O'Connor. "AdQuick is changing that with new tools that make outdoor advertising as measurable as online." To learn more about AdQuick, visit www.adquick.com. AdQuick is the easiest way to purchase and measure outdoor advertising, and is the first company to allow anyone to complete the full cycle of booking outdoor ads online, from searching available inventory, to vetting locations, approving assets and analyzing results. The company was born out of two frustrations with outdoor advertising: a slow, low-tech buying process and the inability to quantify the impact of campaigns. AdQuick solves both problems -- it aggregates the widest variety of inventory nationwide, allows advertisers to book online, and helps close the loop on campaigns with hard metrics on impact and results. Founded by former Instacart executives, the company is based in Los Angeles. For more information, visit www.adquick.com or follow @adquick_. LA startup AdQuick is making outdoor advertising as measurable as online ads.